One of the great things about America — and in particular its cities — is the way people from a wide variety of backgrounds live together. One way to illustrate it is this photo of the door buzzers on a Brooklyn apartment building that I happened to walk past the other morning. 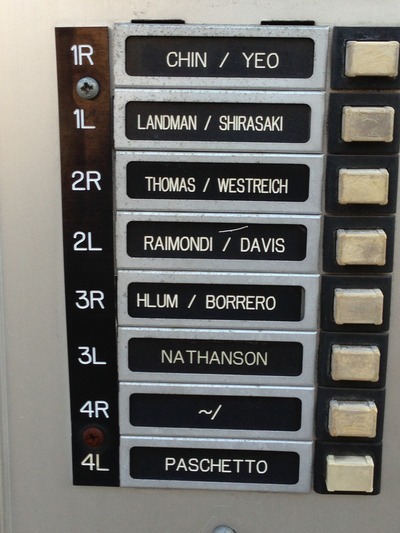 The door buzzers on a Brooklyn apartment building. One can argue that it's antidiscrimination laws that force landlords to rent, or owners to sell, apartments without regard to the religion, race, or national origin of the tenants. But I think bigger factors are the property rights and voluntary exchange of capitalism, along with the American idea that whether your name is Chin, Yeo, Borrero, Nathanson, Landman, or Paschetto, so long as you want to be here and agree to live under the laws, you are just as much an American as anyone else.